Nothing can quite beat the look of natural slate - particularly Welsh slate which lasts for years and is a beautiful choice. Due to the cost of natural slate, over the past decade there has been a growing demand for artificial slate roof tiles which try to give the same appearance. We take a look at artificial slate in some more detail, including the pros and cons and where to buy them. Natural slate tiles have been so popular in the UK from the Victorian era with Welsh slate being the natural slate of choice. There are many stunning period homes in the UK that still have the original natural slate and this can't be beaten in appearance. But advances in technology have meant that some great artificial slate roof tiles have been developed which are more cost-effective and will perform well for decades. There are essentially two main types of artificial slate roof tile; fibre cement slate or concrete tiles made to imitate slate. 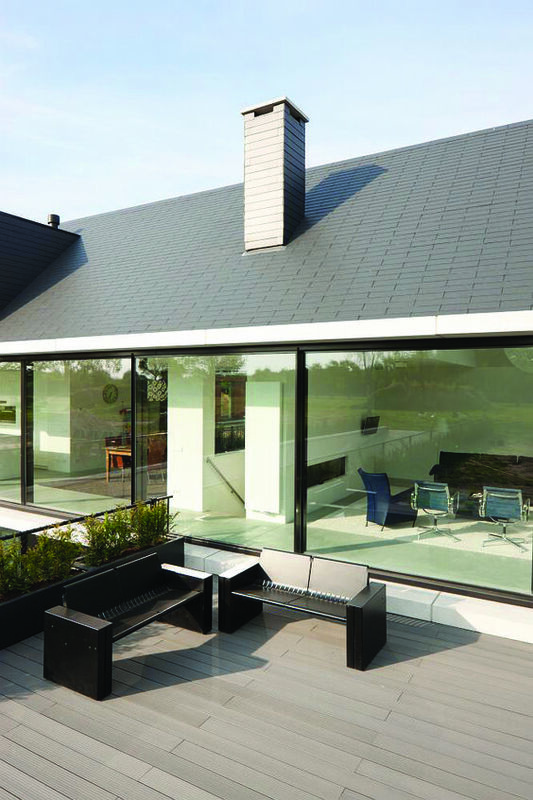 What are the advantages of slate effect roof tiles? The significant savings are from the labour cost rather than the actual material. The uniform style and weight of slate effect tiles makes them easier to lay therefore you will save on the labour cost. Further savings are to be had if you choose an interlocking variety (rather than double lapping) which can be laid with a single nail and clip. Artificial slate roof tiles are also normally much larger in size which again reduces the labour time. A minimum roof pitch of 20º was traditionally recommended for slate roof tiles, however with the advance in technology some slate effect tiles can suit pitches as low as 15º, so often artificial slate is the only choice for some homes wanting a slate roof. If you don't have the roof structure to support heavier natural slate, fibre cement slate in particular is a lighter option to natural slate. Slate effect tiles are often smoother and uniform in appearance, compared to natural slate where every tile is unique. Often modern homes lend themselves to the uniform look however traditional homes favour the uneven appearance of natural slate. Typically artificial slate roof tiles have a shorter life span with the cheaper range on the market only lasting around 20 years. Quality natural Welsh slate tiles last for over 100 years and it is estimated that a new slate roof now will last for around 60 years if you are using quality European or North American slate. However, high quality artificial slate roof tiles can overcome this - market leaders such as Marley fibre cement slates have a life expectancy of around 60 years so they may even outperform some cheaper natural slate. The quality of the roofer will have an impact on the longevity of the roof too, so make sure your roofer is recommended and ensure that they are listed on the National Federation of Roofing Contractors (NFRC) website. Some artificial tiles can be prone to fading in colour within 10 years. However, the technology has greatly improved over the past few years so this should be less of an issue. So when should I choose natural slate over artificial slate? 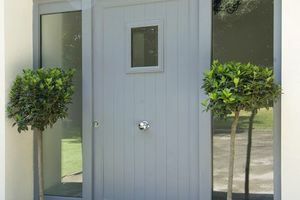 If you are renovating a period property then you are best to go with natural slate as it will be in keeping with the rest of the home; planning will also favour this as it's authentic. However, if you are updating a property to give a modern look then a good quality artificial slate will look really smart. Artificial slate roof tiles are also a popular choice for new builds too. Where can I buy good quality artificial slate roof tiles? The leading suppliers in the market are Marley Eternit who manufacture both concrete interlocking and fibre cement slate effect tiles, so they have plenty of choice in terms of colour, style and price. 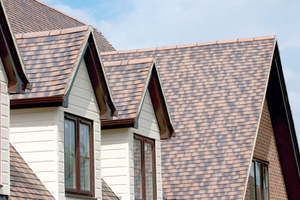 Monier Redland also have a fantastic range of artificial slate roof tiles made from concrete. If you want to go for a modern look, they have smooth tiles but also have great imitations such as the Saxon 10 which is made to copy Welsh blue slate or Scottish black slate. Also worth considering are Weinerberger's Sandtoft tiles such as the interlocking Rivius slate made from alluvial clay. The surface is made to look like natural slate and Weinerberger claim it is 50% more cost-effective than traditional natural slate.